We used to do these all the time, but now that I’m older and most of my friends have settled down, it’s been years since I’ve had the chance to participate in one of these parades. It really is amazing to be able to share a newlywed couple’s happiness with the whole city. My friend Justin got married last weekend, so we did our traditional wedding parade through Tokyo. This parade had a really international flavor, with a Chinese bride and an American groom, but the crowds in Tokyo didn’t discriminate, shouting out congratulations and taking pictures as if the couple were local royalty. The couple was able to share their happiness with the whole city, and brightened up quite a few faces as we went along, and in return, the whole city helped them celebrate the happy occasion. Last night we once again had our seventh annual Christmas Eve Merry Run through Tokyo, filling the night with smiles and sleighbells and V-twin thunder. I finally got a chance to upload a clip from the DVD of the Stinger’s wedding parade through Tokyo. This is a montage of the Hawaii wedding, the Tokyo Harley parade, and the Tokyo reception, professionally edited by our friends from Moment Factory. Stinger, Yuka, and the parade bikes look amazing, and even I end up looking pretty damn cool, if I do say so my damn self. Don’t be fooled by the crappy thumbnail. This is a must-see for anyone thinking of getting married soon, or just for people who like bikes. It’s Christmastime in the City, baby! Jingle bells and the rumble of V-twins brightened up the Tokyo night on Christmas Eve again this year. We had a bit of a late start, but we managed to spread quite a few smiles around the city anyway. I think GB at Riding Sun got it pretty much right, and I’ve said most of what I want to say about this run in last year’s post. Merry Christmas and/or best wishes for the holiday of your choice to everybody! Yesterday we had a wedding parade (like the one we did for the Stinger in August) for Miyazaki-san from our dragon boat team. We had great weather—great weather in December meaning 10℃ (50°F) with lots of pretty leaves blowing around—and amazing crowds wherever we went. This parade was smaller scale than usual—one convertible, eight Harleys, one X4, a Vulcan, and a big scooter as cameraman. In front of Harajuku station, where we got stopped at a long traffic light under several pedestrian bridges, and the crowds grew to several hundred people during the time we were stopped at the light, and then the pattern repeated at the next major intersection. The bride and groom got congratulations from hundreds and hundreds of people, and we brought a smile to quite a few faces. This is one occasion when the thunder of V twin engines is an indisputable force for good. I don’t have anything new to say about these parades that I didn’t say in the last post about them, but it really never gets old. I finished the day with my throat sore from yelling and my arms sore from waving at people, but the smiles on the happy couple’s faces and on the people watching us go by make it all worth it. I can’t wait until next week’s Merry Run. Saturday was the Stinger‘s wedding run and party. We’ve been doing these parades for years for various biker friends and friends-of-friends, and it never gets old. Throw the happy couple in the back of a convertible, surround it with Harleys, ride around Tokyo waving at everyone like you’re celebrities, and people everywhere stop to stare, wave, take pictures, applaud, and shout congratulations to the happy couple. It really feels like the whole city is celebrating the couple’s happiness, and after a parade I always find that the smile muscles in my face are sore from overuse. 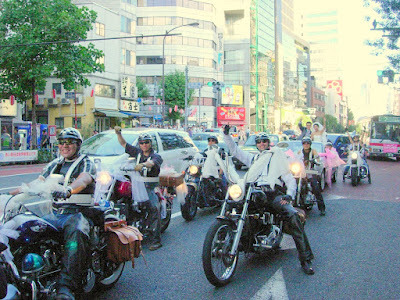 In a country where noisy bosozoku bring down the image of bikers, it’s great to have events like these parades and our Merry Run to show people the positive side of biker culture. Our parades have gotten such favorable reactions that some biker friends of mine who run a small event management company have started offering the service for a small fee. More pictures can be seen at the Gaijin Bikers main site. Update: a clip from the DVD of the parade can now be seen at Google Video. On Christmas Eve, a bunch of my biker buddies and I rode around the streets of Tokyo dressed as Santas, reindeer, snowmen and such, distributing smiles, candy and Christmas spirit. This is a couple of the ladies who ride with us posing on my hog. Those interested in seeing more pictures should check out my Merry Run page. I love Christmas in Japan. Everybody uses it as an excuse to be happy and have a good time, and it’s completely untainted by the actual Christian nonsense that gets forced down your throat in the States. I can wave and smile and yell “Merry Christmas!” to people I don’t know on the street, and they smile and say “Merry Christmas”(actually meri- kurisumasu, the closest you can get phonetically in Japanese) back, and there’s no religious baggage attached–everyone knows it’s just an excuse for a winter festival anyway. After reading about all the ridiculous claims by Christians in the States about being oppressed by “Happy Holidays” I am truly thankful that I am able to celebrate Christmas in a secular society. Christmas should be fun–a celebration of giving and joy for people of all creeds and people of no creed, with pretty lights to brighten a dark winter night–and that’s what it is here in Japan. So a belated メリー・クリスマス to everyone, and best wishes for a happy new year.